Now I had already had a glimpsed at some of Claude Lorrain’s paintings but one painting that really inspired me for this exercise was Frederic Edwin Church Heart of the Andes that I looked at in an earlier research point Different Artists’ Depictions of Landscape. With the red shirts and yellow shirts kicking off here in Bangkok my school has been closed for 3 or 4 days every week for the last week, with them calling a truce just for today, the king’s birthday. 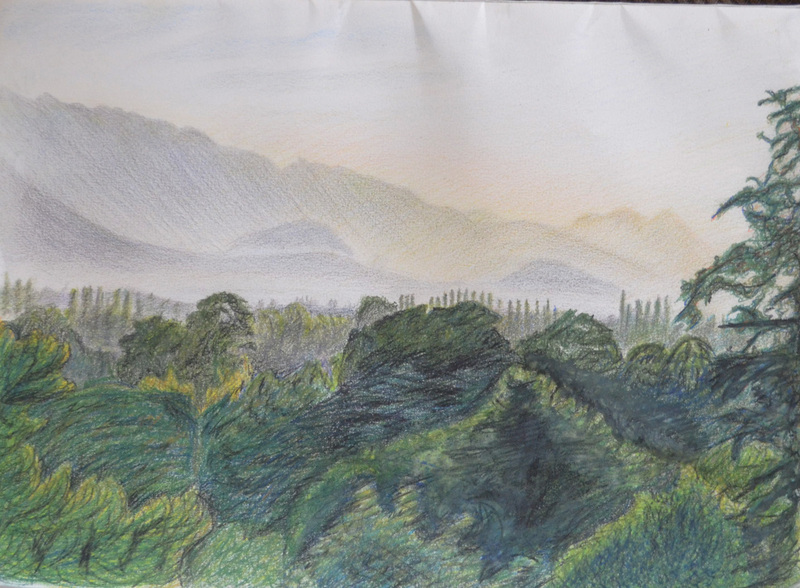 Anyway with time off work we made the decision to go away to Sarabruri for a couple of days and so I decided to take my pencils, an A3 drawing pad and drawing board. 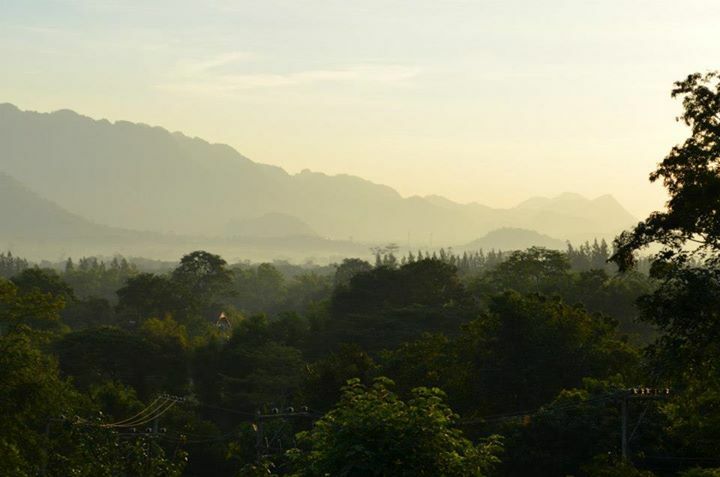 The lodge where we stayed was overlooking some beautiful – what I would call – mountain shaped hills but when we arrived on the first day it was already knocking on so I set my alarm and got up at 6 am. 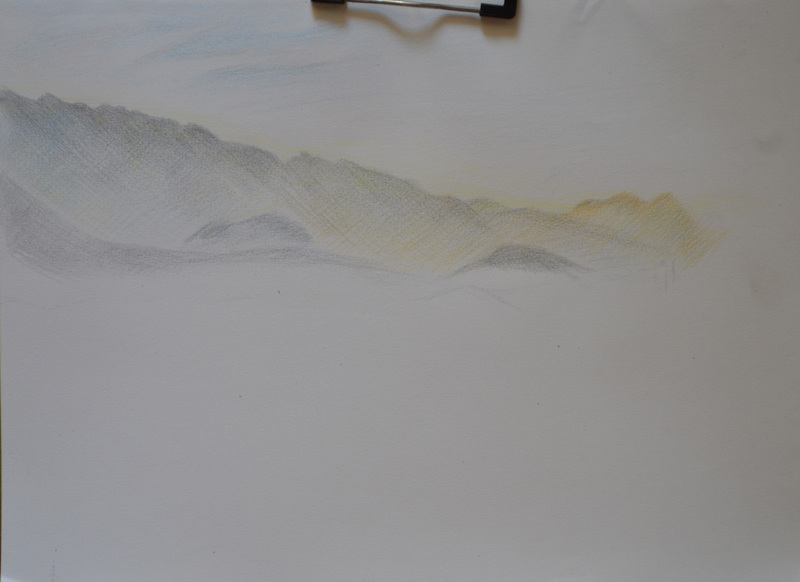 I decided to work from the background down to the foreground as I wanted to get the mountains and the sky just right, However I spent so long working on the mountains that the mist was clearing and I had to keep resorting back to looking at the photo on my Galaxy Tab. 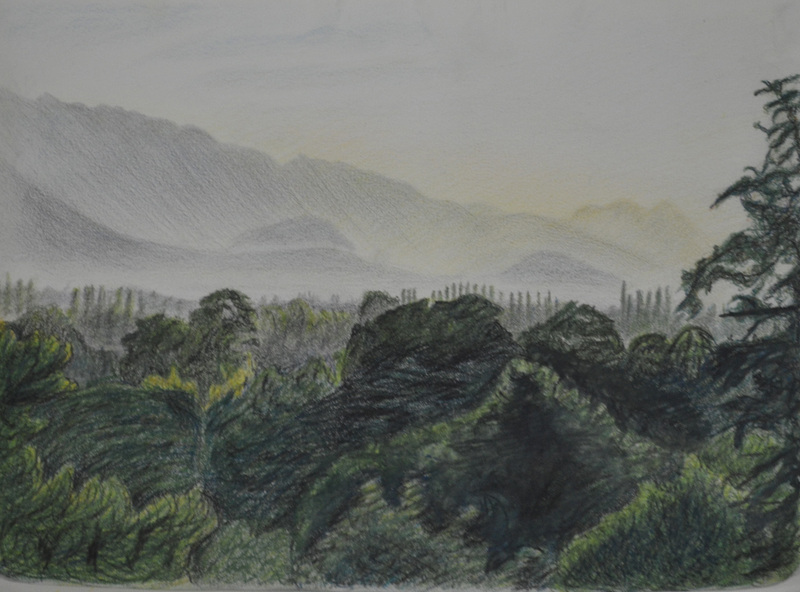 The second step was the middle ground, the mist had all but lifted by now but using the photo on the tablet as reference I blocked in the middle ground areas with a a blend of grey, violet and blue and then drawing in the trees in thew distance with a 2 shades of green and grey to depict the trees appearing out of the mist. Up until now everything was going well but I was about three hours in and so that I didn’t ignore the girlfriend I decided to finish off the foreground, frame the picture with a tree then finish the rest of the drawing off back home in Bangkok and too be honest I was a bit overwhelmed by how many trees I had to draw so needed a break anyway. 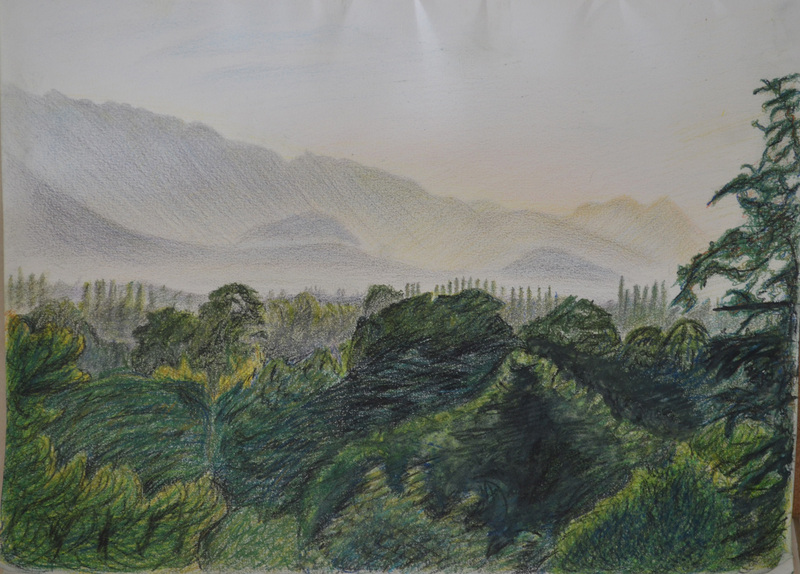 When it came to drawing the big trees in the foreground I started by drawing the outlines of the trees in a lighter coloured pencil, then using irregular hatching for the branches from dark to light colours. I noticed there is a project coming up called Drawing Trees, for me it would have been better to have done that first before this project as I have been drawing nothing but trees since A Sketchbook Walk and it has been a struggle. and this exercise was no different. Due to me not using watercolour paper I refrained from drawing wet until I needed to and that was on the largest tree and three at the side that I framed the drawing with. To be honest not much of this drawing turned out the way I wanted it to, background great, middle-ground great but then the foreground just changed everything and made the drawing look like some kind of dodgy cartoon. 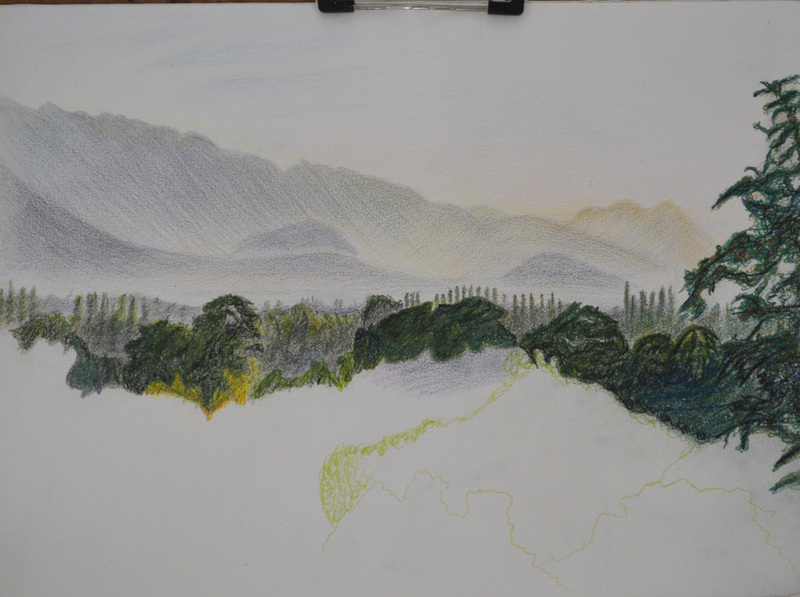 However I am not going to start again as I believe I have achieved the goal of this exercise which was to establish a foreground, middle ground and background in my drawing.